Magnesium is classified as one of the alkaline earth metals, and is listed in the periodic table as Mg with an atomic number of 12. It is considered one of the common elements found on earth, and is necessary for the human body to properly perform over 300 chemical functions. The mineral is essential for the growth and strength of bones, and is also needed for the nervous and digestive system to function properly. Technically the mineral magnesium is found in supernovas, and is transferred to the earth upon explosion. For most of us, this important mineral is located in the foods that we eat and drink. Many dietary experts recommend eating foods that are high in fiber to ensure that you are getting enough magnesium in your diet. Along with foods that are high in fiber, the mineral can also be found in hard water, some tobacco products, and even chocolate. Health care experts have estimated that there is an average of 25 grams of this mineral in your body, and it is not unusual for adults to find that they are not getting enough magnesium in their diets. What Are The Possible Health Benefits Of Magnesium? There are several possible health benefits associated with magnesium, though it is important to note that the mineral is still undergoing testing. Some of the health problems that the mineral seems to be able to help improve include constipation and heartburn. It reverses osteoporosis and prevents cardiovascular disease. Magnesium is also showing to be effective at treating high blood pressure in pregnant women, along with reducing the risk of eclampsia. Using magnesium for any health condition during pregnancy should only be done under the guidance of a health care professional. While testing is still being conducted on its effectiveness in treating other problems, it is showing positive signs of being able to help regulate some patient’s heartbeats. It is also thought to be able to relieve some of the symptoms associated with cerebral palsy, along with improving hearing loss, strengthening weak bones, treat diabetes, migraine, insomnia and depression. There are several other health conditions that the mineral might be effective in treating and relieving, but it should only be used with the approval of your health care professional. What Are The Potential Side Effects Of Magnesium? In almost all cases, magnesium is safe for adults to take orally, and the most common side effects are usually nausea, vomiting, and diarrhea. In most cases these side effects will only last a short while, but a health care professional should be consulted if the symptoms do not dissipate. It is also important for women who are pregnant or nursing to speak with a health care consult. The recommended dosage and schedule for the mineral will usually vary depending on the health condition it is being used to treat. In most cases a treatment involving 3 grams of magnesium every six hours for a total of four separate doses, is enough to ease any mineral deficiency you might be experiencing. It is also important not to exceed any recommended dosage amount, and follow any instructions given by a health care professional. This mineral is often used by itself in supplements and in injections, this it can also be found combined with other ingredients. Magnesium and malic acid are thought to help reduce the pain associated with fibromyalgia, and when it is the mineral is combined as chloride and an oxide it can potentially lower high cholesterol levels. Many women also use magnesium and calcium supplements to naturally strengthen bones weaken by osteoporosis. The natural mineral supplement will often interact with antibiotics, and should not be taken if you are currently being treated for high blood pressure. 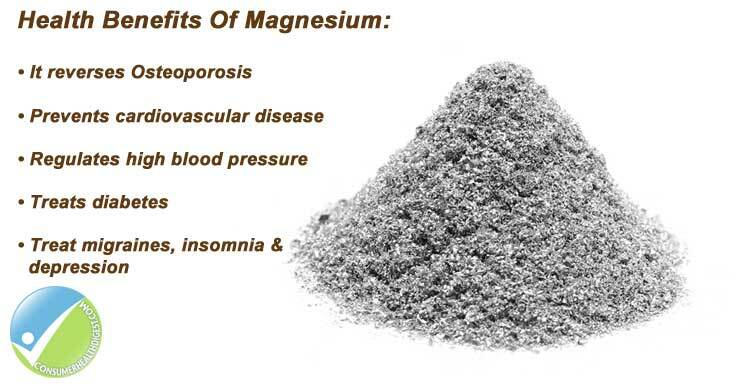 Magnesium should also be avoided if you are currently being using a muscle relaxation therapy. To make sure it is safe for you to take magnesium, a health care provider should be consulted to avoid any potentially dangerous interactions. Magnesium is a mineral that occurs naturally in space and in the planet, and it is essential for many of the body’s chemical reactions to function properly. The mineral is also responsible for bone growth and strength, along with helping to keep your nervous and digestive systems functioning properly. Due to the large amount of magnesium that is generally stored in the body, it is common for adults to experience deficiencies. Even eating foods high in fiber, are not always enough to keep your magnesium levels where it should be. Magnesium supplements are generally considered safe, and can also help treat and prevent a variety of health conditions. While this mineral is necessary for the body to function properly, it should still not be taken without the guidance of a health care professional.